he Nike Sportswear LeBron X EXT has got computers ‘putin and beasts hyping. Sometimes we can’t fathom the level of mania a shoe can incite — after last week’s Area 72 madness, the Nike Sportswear approach to basketball is back to cause mass hysteria. What’s doubly baffling is how long these shoes have taken to materialize — we first clocked them in October last year and now they’re here. When you buy a performance shoe, there’s some serious wear testing to prevent them crumbling on the court, track or pitch, but when the shoe gets handed to the NSW crew, they can go a little wilder. Making one of the most technical basketball shoes ever out of cork is pretty wild — to begin with, we thought that it was a cork-effect leather, but this is the real thing. 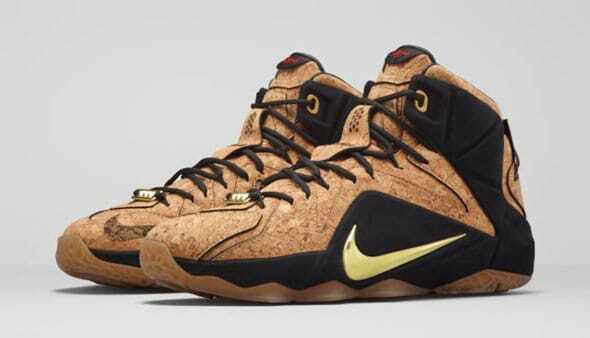 If Oz Clarke or Malcolm Gluck collaborated with Nike Basketball, this is the kind of thing he’d make and while we’d love to see somebody try to play in a pair of cork LeBrons, we’re imagining they’d probably shred on wood or concrete in a matter of minutes. How will the material fare in wet weather or a club environment? We have no idea, but these are even more of a challenge to wear than the real-life strategy game that wearing wheat Timbs entails. Are these made to worship or wear? We’re not 100% sure. There’s a lot to like in the design though – the canvas rand for reinforcement, the red dynamic Nike Flywire that wraps around the foot and emerges as eyelets, the off white sole, the stitched leather lining and the leather tongue are all premium touches that give this model a fresh look that’s not as dumb as they sound when you see them in the flesh.